As I’ve mentioned before, we live on 2 heavily wooded acres with a small lawn of about 900 square feet beside the house. Only about a quarter of that lawn area gets full sunlight in mid-summer, so you know what that means for our lawn, right? Let’s just say it’s not a carpet of lush green grass. When we had some weedy ground cover torn out of the sunny hillside several years ago, we had the area covered with fresh grass. Just because…well, because that’s what Americans do with a patch of dirt: We plant grass on it. We also took the opportunity to re-seed some of the areas nearer to the woods where moss was starting to spread out into the sparse shady lawn. I’d noticed when I mowed the lawn up there, the mower blade wasn’t even touching anything because it was almost completely moss in some spots. But I recently did some reading about moss and I’ve now decided to stop raking it out. I found many articles stating that a moss lawn is nothing to be ashamed of (see links at the end of this post). If we lived in a subdivision with rules about lawns, we probably couldn’t get away with letting our yard go to moss. But since we don’t, it’s full steam ahead with our new low-maintenance moss carpet. Heck, I’m even starting to take pride in it and I might try to convince Eric to let me tear out more grass so the moss can have free rein. It might help my argument if I show him this list of books about moss gardening I found on Amazon; the existence of so many books on the topic helps legitimize the whole idea, don’t you think? 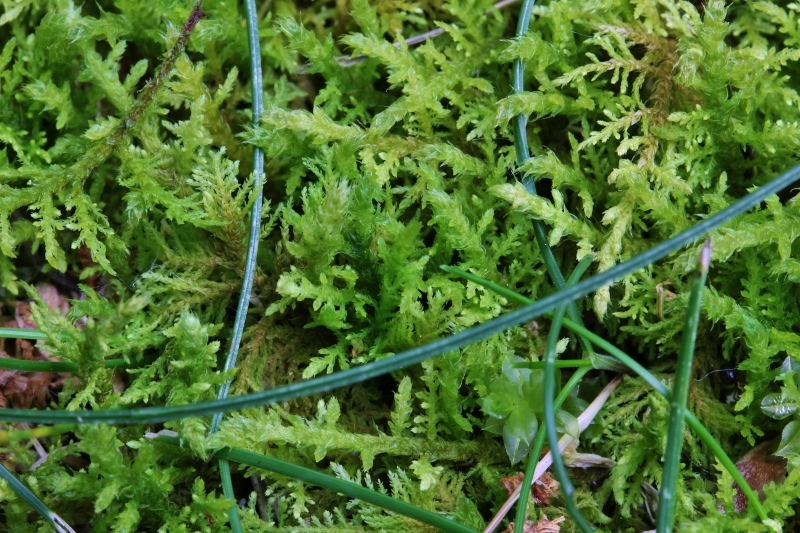 Close up of the moss, with a few strands of grass still hanging on. And have you ever walked barefoot on a bed of moss? You would not believe how good it feels on the toes! So much softer than grass. 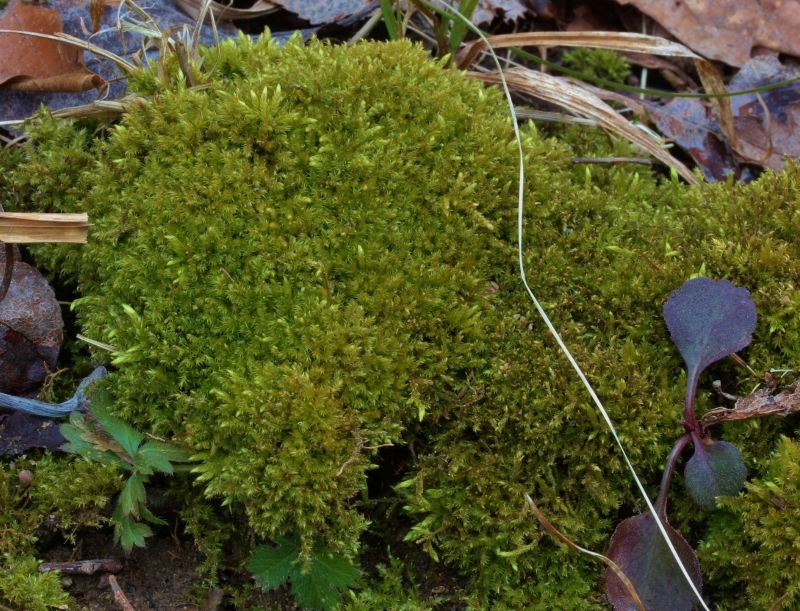 The color is a nice change from what you expect to see on a traditional lawn too — from chartreuse to apple green to the color of broccoli, there’s a broad palette of mosses to choose from. Moss may not be the cultural standard — in this country at least — but it provides the same air-cleaning services as turf grass does. It filters carbon dioxide out of the air and retains moisture. Easy peasy. And moss only needs a tiny fraction of the water a turf lawn needs; just a couple minutes in the morning will keep moss happy, while lawns need extended deep watering several times a week. And if it gets dry, moss will just curl up and wait for the water to come, when it revives itself. Just try that with brown grass. What I love about it: reduced lawn mowing (less noise, gas money, odor, time & effort), no fossil fuels required, reduced water usage, and best of all: more incentive to walk barefoot in nature! This entry was posted in Living in the Woods and tagged eco lawn, moss is the boss, moss lawn, moss on purpose, no more mowers. Bookmark the permalink. 6 Responses to Moss is the Boss! Are you finding that moss lawns take a significant less time and effort (and money) than grass lawns? Americans make way too much fuss about lawns. I happen to love moss and have encouraged it to grow where it seems to thrive. Mostly, we see it in the woodlands, but I do have some in the poorer soils up top. I think it would make for a beautiful landscape. have you tried placing wild ferns in some areas for depth? I notice here in the woods that wild fern does very well in heavily shaded areas. Nice post on awareness for moss landscaping! We have tons of ferns too…I don’t think they’re “wild” ferns, but I’m going to have to look that up. They spread like wildfire though, moving out into the lawn like they wanna own it! I’m surprised to hear that you have moss down there…I guess I have an impression of your area being too hot and dry for it. But glad to know you can wiggle your toes in some moss occasionally! This was an interesting post, Kim. Where we have just moved to there is a lot of moss in the lawn. I actually kind of like the way it looks. Unfortunately though I think we might be in one of those places where they don’t allow you to have a moss yard. Well, you can pretend you don’t notice it growing there and see how long you can get away with it…LOL. So glad to see you’re in the new house!